Have you ever thought about learning Linux? Only to stop short after a bit of exploring. Too intimidating? Difficult to get started. I’ve felt that way many times. But then I had a need that required Linux. Had to have it working to solve a pressing problem, And I did not want to dedicate a computer just for the cause. Hard drive partitioning came to mind. Dual booting to either Windows or Linux. Messy for sure. Definitely not portable from one computer to another. There had to be a better way. 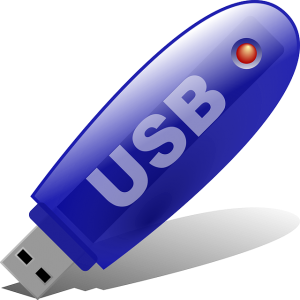 Setup a Linux distribution on a USB stick. Boot to Linux with the stick installed, boot to Windows with the stick removed . <strong>Windows remains intact. With this approach, nothing is installed on the computer. Hmmm. But how do you set it up? And after that, how to you write, compile and execute programs? Sounds complicated. It’s not. Here is a quick and easy way to set things up…. We start with the blank USB stick. 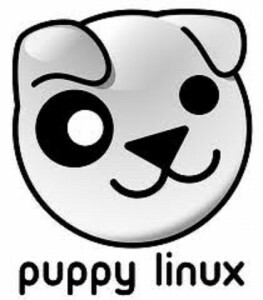 Then head over to this site to download a copy of “Puppy Linux”. For this setup, we are going to use Puppy Linux, a light-weight distribution that is easy-to-use, perfect for a first-time user. You can get both of these files at this site. Great, now you just need to get the USB installer program and your ready to put it all together. Pick up your copy here. The installation is simple. Just install your USB stick and start the installer program. 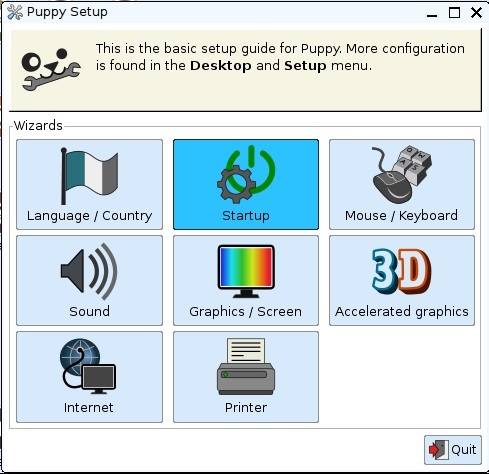 The start up screen will provide 3 easy-to-follow instruction steps. Select the USB stick drive letter. Once this is complete, simply copy the downloaded “devx” SFS file to the root folder of the USB stick. You are now just one step away from completing the setup. 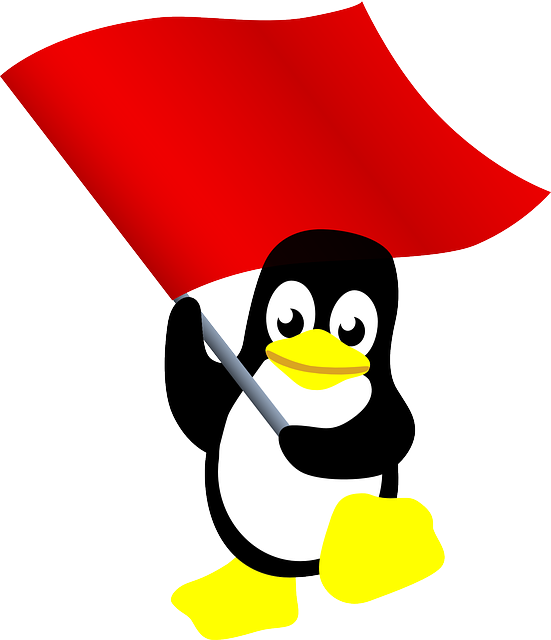 All that remains is configuring Linux to startup with the software development tools active. You have successfully booted up to the Linux OS. But have no fear, nothing has been written to your hard-drive. 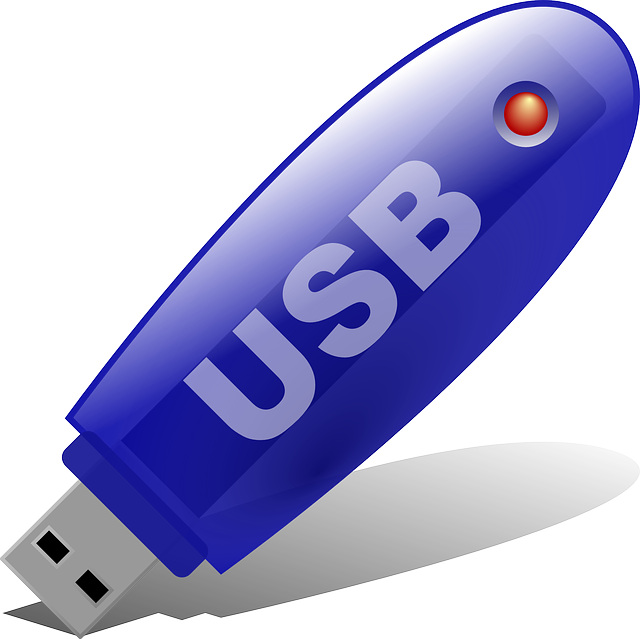 You can return to your normal PC configuration at anytime by rebooting with the USB stick removed. Starting up Linux with the development tool set. The file “devx_tahr_6.0.2.sfs”, the file you put in the USB root folder, should be listed on the left. Select it and click on the “Add” button. 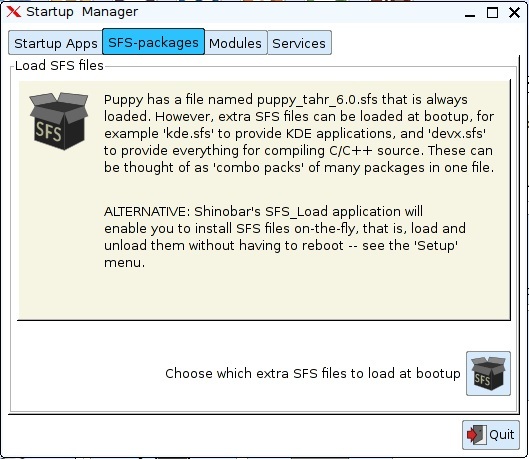 Click “OK” to complete the SFS package at startup selection. Now close all the open windows and reboot Linux from the menu. Let’s keep things tidy by creating a folder for programs we create. And to keep things visible when we use the USB stick with the Windows OS running, the folder needs to be located under the “Home” folder. That is the Linux folder that appears as the “root” folder under the drive letter assigned by Windows. 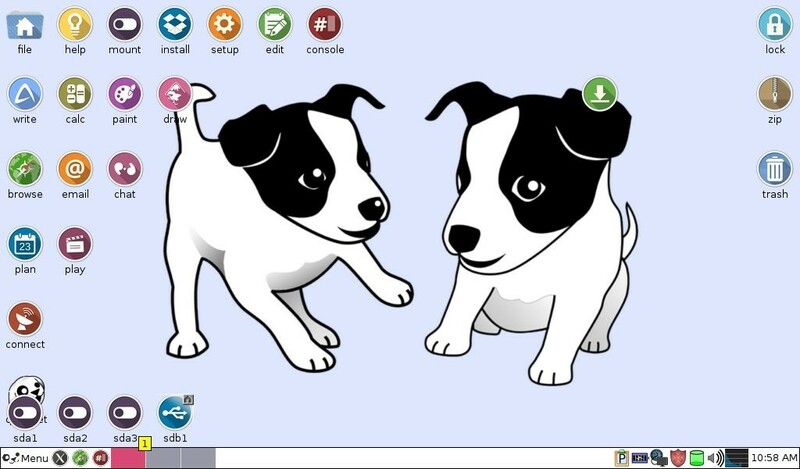 To navigate to the Home folder using the Puppy GUI, first click on the “file” icon from the startup screen. Click on the left “up arrow” icon to get to the parent folder. Then select the “mnt” folder. And finally, the “Home” folder. 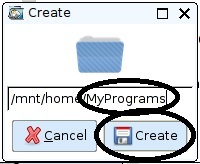 Change “NewDir” to “MyPrograms” and click on the “Create” button. Change “NewDir” to “HelloWorld” and click on the “Create” button. 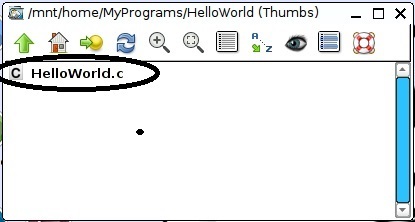 Change “NewFile” to “HelloWorld.c” and click on the “Create” button. 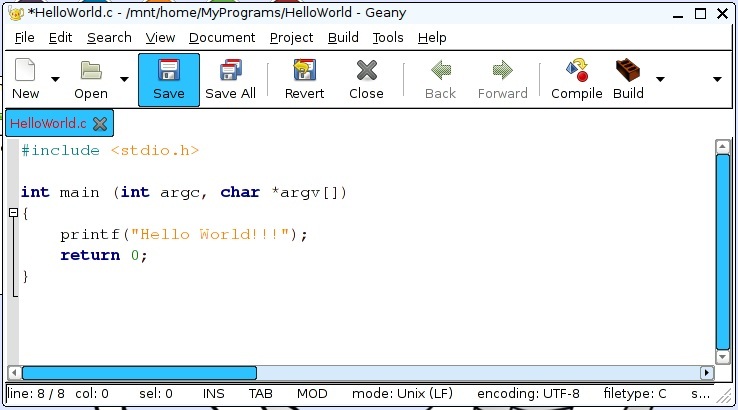 Click on the file listed as “HelloWorld.c” to open the file editor. 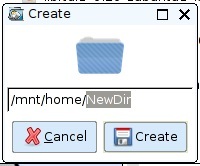 Click on the “save” icon to finish the creation of this file. Got it? Now we are ready to build and execute the program. This can be done two different ways. Using the GUI editor we currently have open. 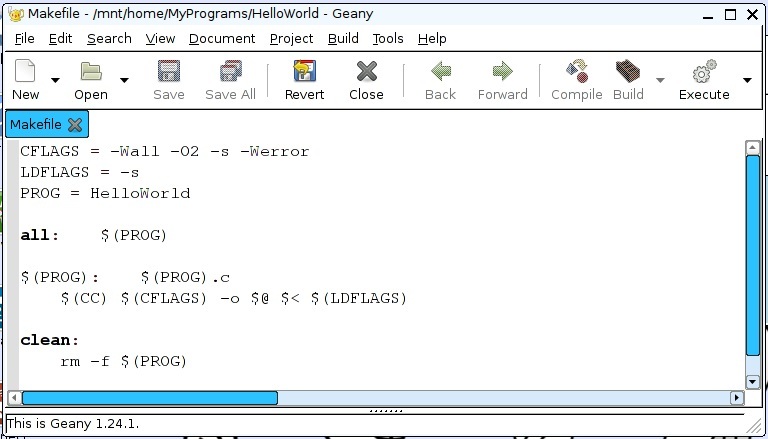 Step 1: Select the “HelloWord.c” source code file tab. Step 2: Click on the “Build” icon. 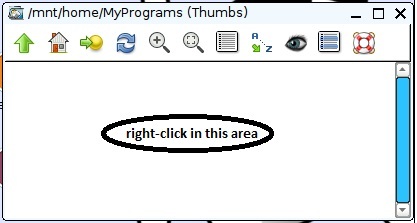 Step 3: Click on the “Execute” icon. Our one-line “prinf” command correctly displays on the console when the program is executed. That’s great for a quick compile and run. But what I found is that if your program contains errors, nothing is displayed indicating what went wrong. Fortunately, there is a way to get needed error messages, when they occur. It requires you to use the command line to build and execute. Now let’s do the same thing from the command line. To open a command line window, click on the “console” icon. You can view a directory listing now to verify the source and “Makefile” files are present with the “ls” command. Now we can build the program with the “make command”. 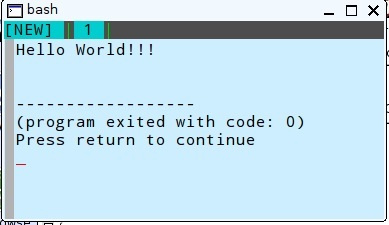 And run the program with the “./HelloWorld” command. That’s it. You are now setup to build and execute programs built for Linux. Now let’s see what happens if we put an error into the program. Enter a bogus line after the printf statement. Like “junk;”, for example. When we try to “make” this program with the error injected, an error is returned. Unlike the GUI, with no error information provided, this provides you with an indication of what went wrong. So you can quickly correct the error. 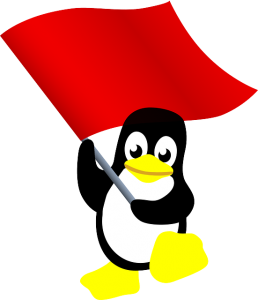 Here you have a simple reference to use to setup a Linux development environment. It is another tool to add to your “bag of tricks”. You never know when it will be needed. Like when the only solution available must be run using Linux. It’s up to you now to explore Linux further. This open-source OS is well supported. You will find all the information you need, as you need it, on-line using basic keyword searches. So have some fun with it! Thank you for this instructional. I have a configuration up and running.Took some digging but I'm "in". I have learned a great deal from all your MQTT related posts. very well done! !